Dr. Alex Shteynshlyuger is a board-certified urologist. 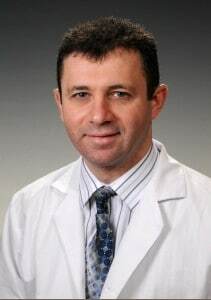 A highly regarded physician-scientist and experienced urological surgeon, Dr. Alex Shteynshlyuger is among a small elite number of fellowship-trained urologists in the United States. He is sub-specialty trained in Minimally Invasive Urologic Oncology. Dr. Alex sees male and female patients with urological problems. He provides office-based consultations as well as hospital-based surgical and urological care. Dr. Shteynshlyuger is an experienced urologist. He is a physician-surgeon who specializes in the treatment of patients with complex urological conditions. He has expertise in treating blood in urine, urinary bladder cancer, kidney cancer and prostate cancer. He specializes in evaluation and management of elevated PSA, PSA screening, and testing. He sees patients in his office as well as in hospitals. He operates at major teaching hospitals as well as at accredited ambulatory surgical centers. Many surgeries are performed in our office under local anesthesia. Dr. Alex Shteynshlyuger is one of the few urological surgeons who has received fellowship training in the use of the DaVinci Robotic surgery. Dr. Shteynshlyuger offers surgical and non-surgical treatment and prevention of complex and recurrent kidney stones with minimally invasive treatment options. He is fellowship trained in Endourology (minimally invasive treatment of kidney stones). Dr. Shteynshlyuger is well versed in open, endoscopic, laparoscopic and robotic surgical approaches to surgical management of urologic conditions. Typically, patients are referred to Dr. Alex Shteynshlyuger from other physicians and urologists for specialized treatment and management of highly complex cases. Many patients self-refer for the second opinion. Dr. Alex Shteynshlyuger is available for consultations, second and third opinions for a wide variety of complicated urological problems including oncology (cancers of the kidney, renal cysts, bladder cancer, prostate cancer, adrenal masses), elevated PSA, abnormal DRE of the prostate, complicated kidney stones, urinary problems (voiding dysfunction) and incontinence in men and women. 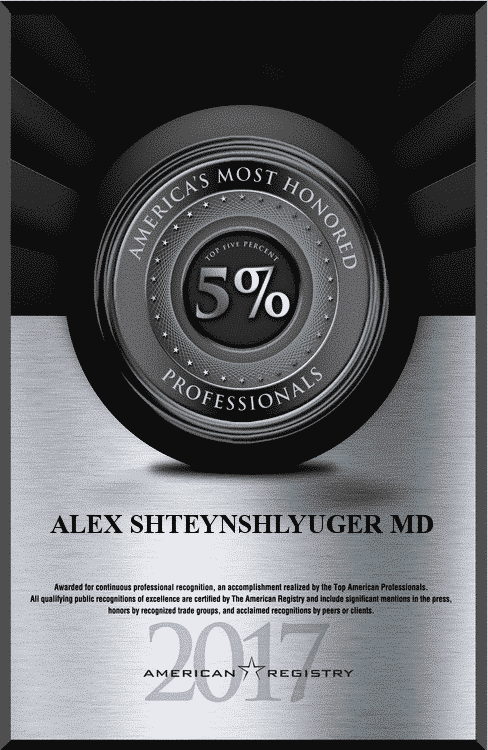 Dr. Shteynshlyuger has been voted Top Urologist in NYC by an independent judgement based on patient feedback. 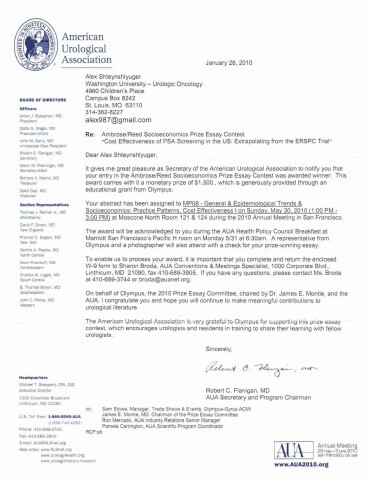 Dr. Shteynshlyuger's research has won national recognition from the American Urological Association (AUA), the most prestigious professional society for urologists in the United States. 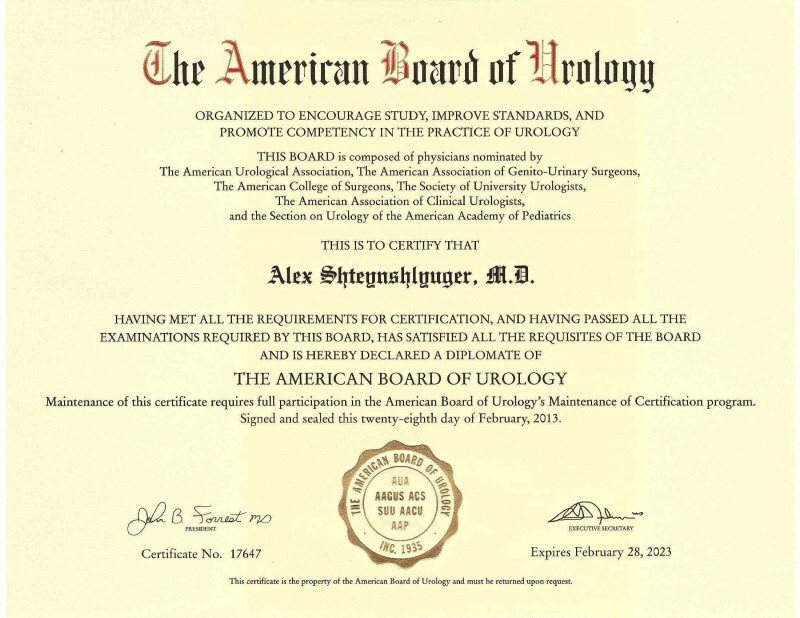 Dr. Alex Shteynshlyuger is a board certified urologist recognized by American Board of Urology (ABU) as a highly qualified urologist meeting the highest criteria for quality and expertise. 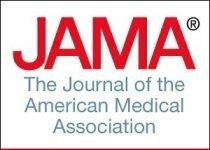 Recognized nationally for research on prostate cancer. Fellowship trained at top US New & World Report Hospital, Dr. Shteynshlyuger brings wealth of knowledge and expertise to his patients. 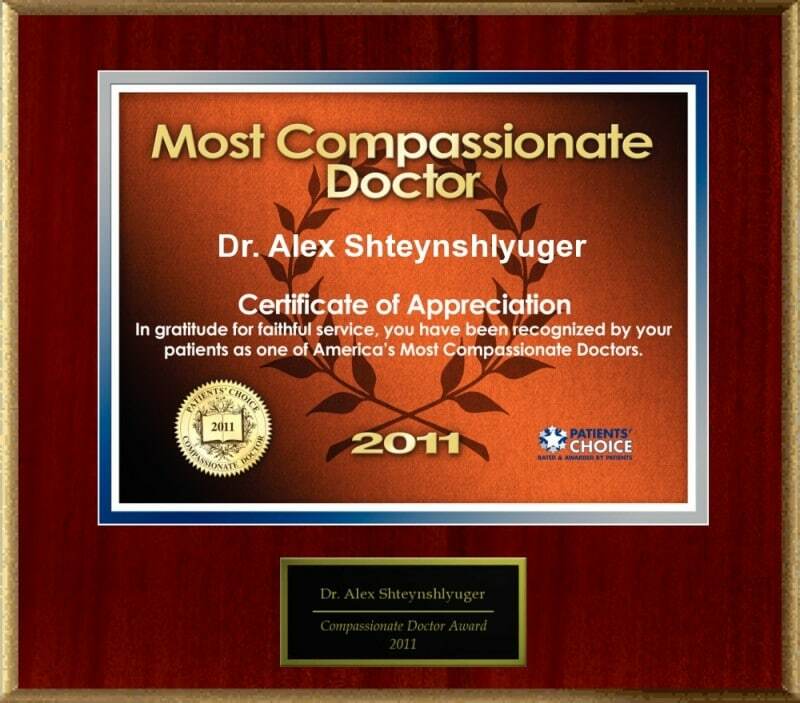 Dr. Shteynshlyuger is highly rated by patients for his compassion and hard work on behalf of his patients. Dr. Alex Shteynshlyuger is a specialist in treatment of men and women with urinary and sexual problems. Dr. Alex Shteynshlyuger is experienced with management of complex urological reconstructions including surgical treatment of urinary leakage (urinary incontinence) in men and women, erectile problems (erections) with medical and surgical management including a penile implant. Dr. Alex Shteynshlyuger speaks fluent English and Russian. 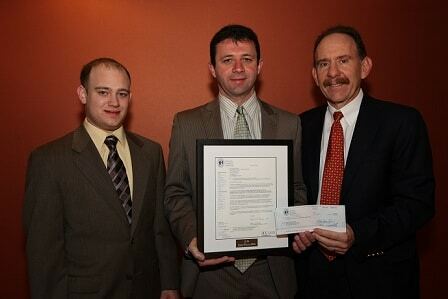 Dr. Shteynshlyuger graduated from public schools in New York City with honors. He went on to Brandeis University for undergraduate education. He graduated with honors double-majoring in Biology and Economics. He then came back to New York for his medical education at the highly ranked SUNY Downstate School of Medicine where Robert F. Furchgott discovered the role of nitric oxide, which led to the development of Viagra. Dr. Furchgott was recognized with the Nobel Prize in Medicine in 1998 for this discovery. 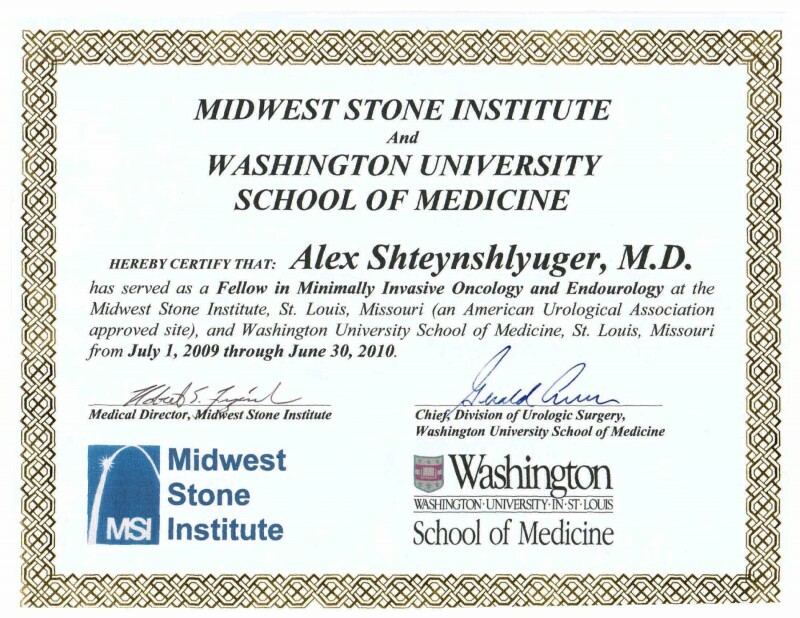 Subsequently, Dr. Shteynshlyuger trained at a top ranking hospital for complex specialty medical care, Maimonides Medical Center, and the Washington University in St. Louis as well as at the Barnes-Jewish Hospital. There was never any follow up on procedures or medications. The rest of the staff is extremely nice and caring, but when I would come in in tears and pain, I felt like there was no sympathy from the Dr. Only a prescription for Valium and a "calm down and go back to work." When you're in a city alone and in serious discomfort that is affecting every aspect of your life, the last thing you want to hear is, "calm down." You want to be comforted and have someone express they are sorry you're in pain. You want to be treated as a person and not just a name on a patient chart.